There are many ways to improve your smile and make your teeth whiter these days. One way of doing this is by getting porcelain veneers from one of our dentists. Once you get porcelain veneers, you will notice a dramatic change when it comes to your teeth’s looks and function. Here are the reasons to choose porcelain veneers over other materials. Porcelain and tooth enamel are both white. In fact, they look very similar that you will not see the difference from afar. Porcelain looks so natural that our dentists choose it as the main material for our veneers. Just like enamel, light that enters porcelain bounces back, resulting in a natural smile. Another advantage of choosing porcelain over other materials is its resistance to staining. Coffee and red wine will not stain porcelain because they just simply roll off the surface. This means you do not have to change your lifestyle after our dentists put porcelain veneers on your teeth. You can eat or drink anything you want without worries. Porcelain veneers have a high success rate. In fact, they can last for years if done correctly. You just have to follow our dentists’ post-treatment plan and you are good to go. Do not forget to brush your teeth with a soft-bristled brush to maintain the veneer’s looks. Unlike other procedures, porcelain veneers are comfortable to wear. In fact, you do not even feel like you are wearing anything with our porcelain veneers. Our porcelain veneers will not get in the way when you talk, drink, or eat. Porcelain veneers are also known as instant orthodontics because they create an illusion of whiter and straighter teeth. Patients with crooked teeth often cannot believe how much their looks improved after wearing our porcelain veneers. Compared to other dental procedures, it will only take two to three appointments to get porcelain veneers. After our dentists get your teeth measurements, you just have to wait for two weeks to get your porcelain veneers. 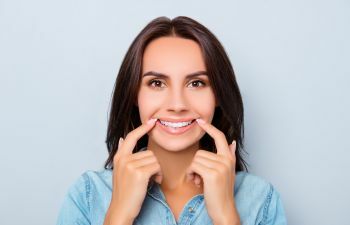 Getting porcelain veneers is a quick and painless way to improve your teeth’s looks and function. For more information on this procedure, check out our contact number by visiting www.goldhilldentistry.com.